No mountain, no problem! 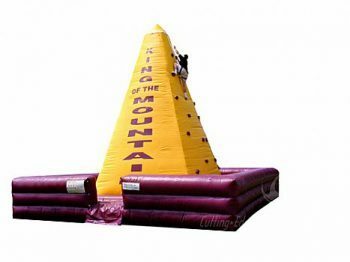 Rent this inflatable for your next event and presto, a rock climbing mountain towering nearly 30 feet tall will inflate before your eyes! Our Fun Engineer on duty will get participants harnessed in and ready for the ascent. Take your time going up or race to the top against someone else on the other side of the rock climbing wall. Once to the top, you can belay down easily with our auto-belay system. Min. Participant Height: 4' 6"